This is a delightful tale of a ducks at play from the creator of "Floss and Goodnight", Harry. 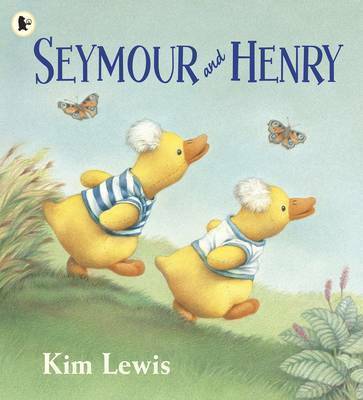 The ducklings, Seymour and Henry, don't want to stop playing at the end of the day. It's far more fun to run away and hide. But they wait and they wait, and still Mummy doesn't come. Then, plip plop, the rain starts to fall, and hiding doesn't seem nearly as much fun. 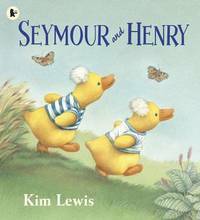 So back run Seymour and Henry, as fast as they can, to Mummy, who is waiting to take them home to bed. Kim Lewis is an artist, author and printmaker. Born in Canada, she studied fine arts in Montreal before moving to the UK. From a series of real life farm stories (Floss, Just Like Floss, Emma's Lamb) to the imaginative world of a stuffed elephant called Harry, Kim has always tried to capture the wonders of a child's life in the countryside. She lives with her family in Northumberland.